World city or regional backwater? Singapore of 2065 could be a world capital of gleaming towers, creative talent, power, influence and wealth; the most important centre of a region of peace and prosperity; and an inspiration to those who dream of what it takes to build a better society. Or by 2065, Singapore could be mostly faded glory, not a bad place to be, but one with a better history than future. There is a third possibility of a slowly growing developed city - but that would still lead the city-state into a slow but inexorable decline: Think of a graceful old age with declining prospects. Where is Singapore headed? What are the trends that will shape its possibilities? What should Singapore aspire to in the next 50 years? As a futurist with a three- decade-long association with Singapore, I have had the rare privilege of periodic conversations with its first Prime Minister, Mr Lee Kuan Yew, sharing perspectives on where the world is headed. Singapore's success owes greatly to his leadership, making him one of the greatest political and economic leaders of the 20th century. He died in March, and the challenge will be sustaining his legacy. I have also served on various agencies in the city-state. I would say Singapore has been moving in the right direction, keeping itself open to talent and driving innovation. The question is whether that can be sustained. At independence in 1965, security, stability and prosperity were the main aspirations. For the future, Singapore needs to have dreams of its future that can keep the talent coming. For those dreams to be real, they have to gel with the driving forces and the ethos that shape the times today, as they did during independence. So what will determine if Singapore becomes a world city or declines into a backwater? What forces shape its future? Some are beyond Singapore's control, like the global balance of power and regional stability. Others - like the quality of governance or the ability to exploit new knowledge - are within Singapore's control. THERE are a few long-term, predictable forces. The population cannot grow by very much. If the country builds upwards, or downwards or even a bit outwards, it might add another million or so, mostly immigrants and mostly the young. Today's population will inevitably be older. Even if many remain healthy, vigorous and stay in the workforce much longer, many will be so old by mid-century that dependency will increase substantially. By 2065, Singapore has to be ready to manage a very old, infirm population and invite in young immigrants to help support that ageing population. The need to adapt to climate change is also predictable. The weather will be more variable and the seas will be rising. As part of my ongoing work with the Centre for Strategic Futures in the Prime Minister's Office, I had the opportunity to study the impact of climate change on Singapore in some depth. The building of future infrastructure will need to take into account the rise in sea level, storm surges and potential for torrential rains. Planning for a system of dikes may be needed. As for energy, I expect the fossil fuel era will be winding down by 2065, driven by the pressures of a rapidly changing climate. Unless there is a major breakthrough in renewable energy, Singapore will be an all-electric country, including electric cars, generated by nuclear power. The reactor may be offshore, underground or in a neighbouring country. Nuclear may be the only way to generate sufficient power for a modern wealthy economy without producing too much carbon dioxide. WHILE a few trends are predictable, more are uncertain. The first question is whether the economy will be able to sustain economic growth and whether that growth will be fairly equitable. Another 50 years of even slow growth will leave Singapore incredibly rich. But creating vast wealth in the hands of only a few will not be regarded as success. For growth to be equitable, new industries need to take off that will employ large numbers of people in high-value jobs. People need to be trained to fill those jobs. There is no guarantee of success on both counts. The old industrial economy will inevitably give way to a new economy based on ideas and skills in high technology, healthcare, finance and tourism. Singapore is well-placed to take advantage of all four arenas, is already investing appropriately in them and has a good chance to succeed. The most important uncertainty within the control of Singapore is the continued success of the system of politics and governance. It delivered on its vision in the first half century after the nation was born. Can it continue to for the next 50 years? Success is the worst enemy of change. Why bother to change when things are working? But that is when you have the most manoeuvring room and resources to act. How does Singapore not become a stultifying bureaucracy wedded to the status quo? Will its bureaucracy make room for the young and ambitious? How can its government move and adapt at the pace of the modern world? Will initiatives like the Smart Nation make Singapore a continuing model for future governance? Will the high performance and near complete absence of corruption sustain the legitimacy of the system with the people of Singapore? The answers to all these questions are not predetermined and will be shaped by the choices people make, the quality of leadership and events beyond their control. The forces that are most vital and out of Singapore's control are the politics and economics of the region. Most regional trends in recent years have been fairly positive economically and politically. Will its neighbours and partners continue to improve governments and economies, or will they devolve into incompetence, corruption, poverty and conflict - that is, take a big step into the past? The former creates regional conditions conducive for Singa- pore's success. The latter scenario will make it very difficult for Singapore to succeed. Walling itself off from a chaotic region will not be regarded as success. Singapore will be sailing against the wind. In the worst-case scenario, major conflict involving big countries like China, Japan, India or the United States greatly damage the prospects of the region and Singapore. On the other hand, increasing integration and coherence can feed on themselves and accelerate growth and prosperity. The final uncertainty is what role Singapore will play in the world. It is already an example of successful development to many other cities. But if it stagnates and is trapped by its own success, its role as an exemplar will also fade. If it uses the platform of its success to aspire to an even more important role, then it will remain a shining example of how to build on success, and continue to attract the talent it needs to excel. BY 2065, 80 per cent of the world's people will live in cities. Cities are where ideas are born, where growth happens and where problems are addressed. Among the many huge cities on the planet, a few increasingly stand out as important capitals, even if they are not the capital cities of their nations. They include New York, Los Angeles and San Francisco, Shanghai, Mumbai and Sao Paulo. They are where the brightest talent goes and where the future is being created. In this competition among cities, a land-scarce city-state with no hinterland and no mineral resources will not be at a disadvantage. Skyscraper to skyscraper, densely packed Singapore can compete with the best among cities. It can aspire to be among those cities that are truly world capitals. How? Singapore can aspire to some combination of five targets for which it is well positioned. The measure of success is not how many jobs are created directly. Rather it is about attracting the talent needed to create an economic ecosystem of constantly evolving new sectors. The best example of this today is San Francisco Bay Area where I live. Talent flows here and draws even more talent, driving one of the world's highest growth rates. That is what Singapore is already becoming and what it needs to keep building on. A globally ageing population will want access to the best healthcare on the planet. Singapore is already a healthcare hub for the region and a rapidly growing centre for related research and development, and manufacturing. There is every reason to invest more and create the conditions to become the world's healthcare leader. Singapore has also made substantial investments to expand its education and research capabilities. In a world economy driven by talent and new ideas, Singapore has the potential to be another Silicon Valley, generating both basic research and economically valuable ideas that create new wealth and status. It is not hard to imagine the day when Singaporeans - or people working out of Singapore - win Nobel Prizes and create the next Intel or Google. Many of the world's great cities are home to global institutions like the United Nations or World Health Organisation. The world needs an Environmental Protection Agency. Singapore could be its home. Many environmental issues do not respect national boundaries - from climate change to plastic waste in the oceans. When international telegraph took off, the International Telecommunication Union based in Geneva was created by nations to regulate terms of access to things like spectrum and satellite parking spaces. Evolving needs lead to new institutions. Singapore is a minimal polluter, technically sophisticated, adept at market-based regulation and completely honest. It could take the lead in creating this Environmental Protection Agency and giving it a home. Due to its location at the equator, Singapore is an ideal location to launch rockets into earth orbit, from an orbital physics point of view. By 2065, the cost to orbit will have fallen drastically and more economic and tourist activities will rely on orbital launch. Singapore could be the planet's great spaceport, even attracting tourists just to see the launches. Finally, Singapore has one of the best military, intelligence, police organisations in the region. From the shores of East Africa to the South China Sea to the Sea of Japan, security issues will continue to be critical to regional stability. Singapore's small size gives it the advantage of being considered unthreatening. It is recognised as being especially competent. Singapore could lead new regional security efforts to deal with crime and interstate tensions. The worst thing that could happen to it would be a destructive regional war or a dramatic rise in crime. Its leadership in security matters could help mitigate those risks. When you put all these forces together, it is possible to describe two very different future possibilities for Singapore, as it deals with an older population and the need for immigration, as well as adapting to climate change. 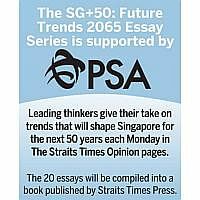 If Singapore fails to make it as the new industries' economic powerhouse, if its Government becomes sclerotic and corrupt, if the region is chaotic and violent and if it aspires to maintain only the status quo - then by 2065, Singapore will be an irrelevant backwater from which talent leaves, a nation in decline, more or less gracefully. If, on the other hand, it makes a successful transition to the idea economy; if the vitality, competence and legitimacy of its Government are sustained; if the region is stable and prosperous, then it will be a true world capital, the city of the future into 2065. The choice is in the hands of the Singaporean people.